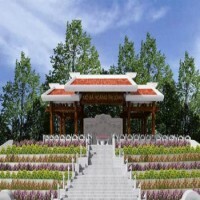 The tomb of Mrs Hoang Thi Loan, Uncle Ho’s mother, is about 14 kilometres from Vinh city, where Ho Chi Minh Square and Uncle Ho’s statue are located. The tomb is placed on Dong Tranh Mountain peak, which belongs to the Dai Hue mountain range in Nam Dan district, Nghe An province. The tomb was built in 1985, on the occasion of President Ho Chi Minh’s 95th birthday anniversary. Mrs Hoang Thi Loan was the second daughter of Mr Hoang Duong, Bachelor of Arts, a native to Hoang Tru village, Nam Lien commune, Nam Dan district. She married Nguyen Sinh Sac and gave birth to three children. In 1895 she and her family moved to the royal capital of Hue and made a living for the whole family while Mr Sac was busy preparing for an academic degree. She died of fatal disease in Hue in 1901. Also in that year, her husband achieved his scholar degree. Mrs. Hoang Thi Loan (1868-1901) was the mother of many patriotic children, including Nguyen Sinh Cung, who later became President Ho Chi Minh. From the mount foot, visitors will have to climb nearly 300 stone steps leading to the tomb. Above it is a concrete roof stylised as the loom with which Mrs. Hoang Thi Loan used to weave cloth to earn a living and feed her children.